Gary graduated from Newburgh Free Academy in 2011, during which time he would often be found volunteering at St. Luke’s Community Hospital. After earning his associates from Orange County Community College, he pursued a bachelor’s in New York City at St. John’s University. 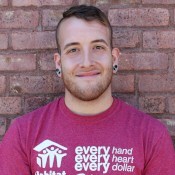 Gary joined the Habitat Newburgh mission in 2016 working in the ReStore. While there, he learned the ins and outs of how the organization functions, from relationships with Habitat Volunteers to garnering ReStore donations throughout the Hudson Valley. As of late 2018, Gary now brings his experience and character to the wider Habitat mission as our Volunteer Coordinator. With him comes his enjoyment of the guitar and ultimate frisbee.